Daryl Gurney will be making his first TV appearance in his home country fresh off the back of winning his first Premier League match last Thursday when he defeated Mensur Suljovic 7-3. With the match against Suljovic level at 3-3 he won four consecutive legs to earn the vital two points. A big factor in his win over Suljovic was his improved finishing; his checkout percentage of 54% was comfortably his highest match checkout percentage of the tournament so far. 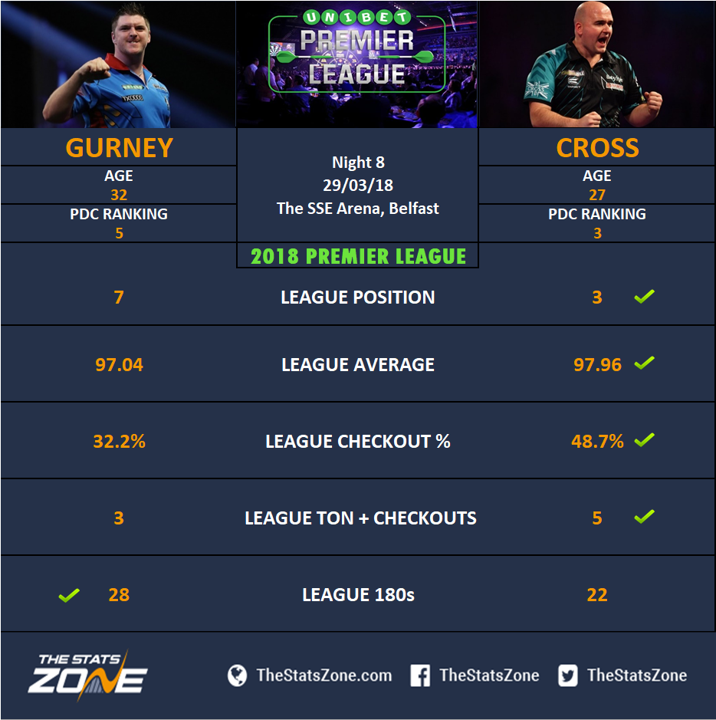 Gurney has lost just one of his last five Premier League matches, with that sole defeat came against the reigning Premier League champion Michael van Gerwen. Rob Cross demolished Gerwyn Price 7-1 last Thursday in Glasgow to register his fifth consecutive win in the Premier League and his biggest Premier League win to date. Cross is third in the table and has dropped only three legs during the last two Premier League nights. Cross had an excellent checkout percentage of 70% in his win over Price. Overall, his checkout percentage for the last four matches combined is a very impressive 68%. The 180’s have started to flow for Cross in recent weeks. He managed a total of two across the opening two weeks, AND since then he has hit an average of four per match over his last five matches. Daryl Gurney is sure to have massive support from his home nation crowd and he will be feeling a lot more relaxed on stage due to getting his first win last week. He does have some distraction away from the board though as he is about to become a father at any moment! It is unknown if this will impact his game though. A big positive for Gurney last week in his win over Suljovic was the fact his form on the doubles was much improved and that certainly bodes well as his scoring continues to be up there with the best. Rob Cross has motored up the league table in recent weeks on the back of some excellent all-round performances. Both his scoring and finishing have been very effective and the results and statistics prove this. Gurney may have the home support and the ability to really trouble Cross, but when it comes down to the business end of legs, Voltage has the vital edge.